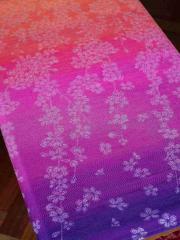 A mirrored fade of warming wine tones combines with a light golden weft on this gorgeous Blossom wrap. Woven with organic combed cotton and hemp this wrap is strong and supportive with a lovely hint of shimmer. This wrap will break in with just a little wear to become buttery soft, making it perfect from newborn to toddlerhood. Woven on a bright fade which runs through sunset tones of oranges, pinks and purples, the falling petals of our Blossom pattern are picked out in alternating tones of fresh ecru. Alternating hemp and Tencel not only give a lovely stripped effect across this wrap but make for a sling which is soft and mouldable with a wonderful strength. This supportive wrap needs just a little love to become buttery soft, but will soon be perfect for little ones right through to toddlerhood. CARE INSTRUCTIONS: Wash at 30 degrees, avoiding bleach and fabric softener. Hang to dry, cool tumble dry can be used but air drying is recommended. Iron on a cool setting. FABRIC COMPOSITION: 57% organic combed cotton, 7% linen, 20% hemp, 16% tencel, 68cm wide. Inspired by the changing colours of the Northern Lights this stunning sling features a cottolin warp with a black Superwash wool weft. Soft and malleable with a little woolie cush this sling is a great all-rounder. Perfect for little ones and with enough support for bigger kids too. Superwash wool is supple without being itchy or thick and can be washed in a machine on a delicate cycle at 30 °, making it a great blend for busy families who love wool wraps! CARE INSTRUCTIONS: Gentle machine wash cycle at 30 degrees on a delicate or wool cycle, avoiding bleach and fabric softener. Lie flat to dry. Iron on a cool setting. FABRIC COMPOSITION: 40% organic combed cotton, 18% organic linen, 42% Superwash wool, 68cm wide. FABRIC COMPOSITION: 40% organic combed cotton, 43% viscose linen slub, 17% Tencel, 64cm wide. OUR MODEL: Jenna carries Olivia uses a size 6 for a Ruck. This gorgeous fade flows from baby pink through coral and magenta tones, to pastel green hues. 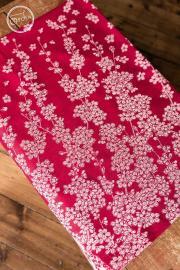 A peachy pink weft picks out the falling petals of our Blossom pattern creating a lovely fresh effect on this stunning wrap. Woven with a dual hem from organic combed cotton & linen for a soft, strong wrap with Tencel adding a hint shimmer and a lovely breathability. The wrap is strong enough for bigger kids and will soften with wear to become soft enough for tiny ones too. 52% organic combed cotton, 34% linen, 14% tencel, 240gsm, 70cm wide. Light in hand and featuring all the wonderful benefits of wool without the bulk Blossom Olivia is a gorgeous mix of Superwash wool and organic combed cotton. 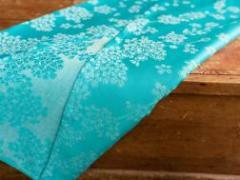 Temperature regulating, strong and wonderfully soft this warm teal wrap is perfect for bigger kids and tiny ones alike. Blossom Olivia will be released tomorrow, 31st October, at 4pm (GMT) as part of our After Dark Collection. 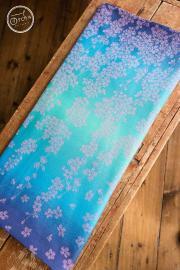 Woven on our Loch fade which runs from indigo through fresh blues into a central muted turquoise and back out to indigo, the falling flowers of our Blossom pattern are picked out by a soft, baby pink weft creating a gorgeous contrast on this stunning wrap. Woven from organic combed cotton, wild silk and cotton and finished using our soft-touch technique this wrap come broken in straight from the bag. Cushy and soft, with a delicate strength coming from the wild silk, this wrap has a beautiful drape and will be perfect for all ages. 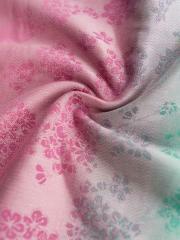 Wild silk is well loved by our customers as a breathable, summer wrap. 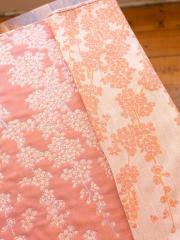 The falling flowers of our Blossom pattern are picked out by a soft, baby pink weft creating a gorgeous contrast on this stunning wrap. Finished using our soft-touch technique this wrap come broken in straight from the bag - wild silk is well loved by our customers as a breathable, summer wrap. 56% organic combed cotton, 22% wild silk, 22% cotton, 253 gsm, 66cm wide. 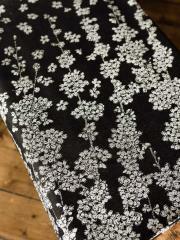 Black and white perfectly showcase our stunning falling blossom pattern on this timeless and classy Prototype wrap. Organic combed cotton and Tencel work together wonderfully to create a soft wrap that is light in hand, silky smooth with a little grip and which will only soften more with wear. "I was surprised how floppy the wrap was from new. It also felt silky and soft in hand. I was pleasantly surprised when I wrapped with it for the first time - it really did wrap itself. It made real light work of it, soft with a steady glide and subtle grip. It held well too, offering bounce without stretch. The glide helped me tighten evenly through the wrap which offered my best back carry finish to date. I think this is a great all rounder blend." 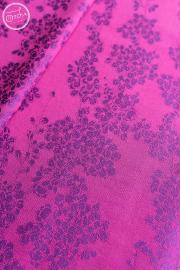 46% organic combed cotton, 54% Tencel, approx 302gsm. 7 wraps and 2 ring slings have been made. 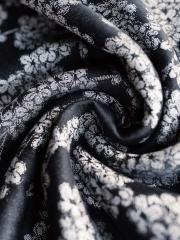 Ecru flowers peek through a black backdrop on this striking Blossom wrap. This wrap is woven with a very thick yarn which allows us to use less cotton. This produces an interesting effect in the pattern and leaves the wrap feeling wonderfully thick in hand. This is a wrap that will soften significantly with use, but will need a little work before it is buttery soft. Tussah silk lends a beautiful strength and breathability, while wool adds great temperature regulation for all round wear while staying snuggly for the cooler months too. "Strong, sturdy, supportive & wonderfully grippy. It has a fabulous Velcro like grip to sustain even the sloppiest quick wrap job. With a little breaking in, it has become much more supple without losing that rock solid security - it is now easy to tighten and tie off while still being wonderfully thick & cosy." 38% organic combed cotton, 31% tussah silk 31% wool, approx. 396gsm. 4 wraps have been made. 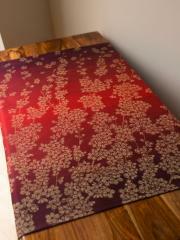 Stunning white blossom falls over a true red on this gorgeously cushy wrap. Woven from a mixture of cotton and pure bamboo this wrap has a lovely drape making passes easy, while a little grip from the pattern gives this wrap real staying-power. This a wonderfully soft wrap with a good amount of cush for the shoulders and a nice, cosy to thickness it. Straight out of the bag this wrap is perfect for all ages but it will only get softer and more malleable with wear. 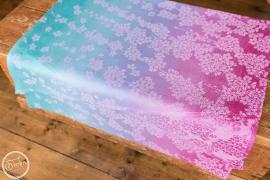 Delicate magenta blossom falls over bright purple on this gorgeously vibrant wrap. 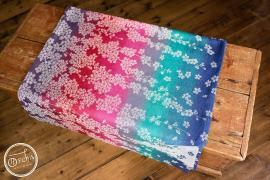 With small flowers picked out in contrasting colours, both sides of this wrap are stunning - making this a versatile wrap which will look great with many carries. Woven from organic combed cotton for a hint of gentle cush and with Superwash wool for softness and breathability this wrap has a delicate strength which makes it suitable for all ages. 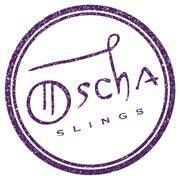 This sling will soften beautifully with time. Made with Sea Island cotton & organic linen - strong, luxurious & beautiful. 59% Sea Island cotton, 41% organic linen, approx. 272gsm. 23 wraps and 8 ring slings have been made. 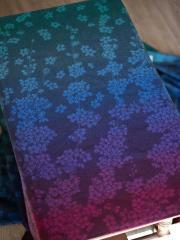 Cherry blossom in subtle pink floats across a fade of magenta to soft purples and turquoise. Woven with pure bamboo and a touch of linen, this wrap is cushy, strong and will soften beautifully. This can be used easily with big kids even in single layer carries. As well as being easy-care, bamboo offers natural UV protection, is anti-allergenic, moisture-wicking & breathable. 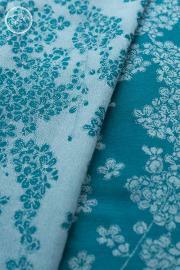 Blossom is a new pattern from Oscha - petals float softly down from laden boughs. Woven with a soft wild silk and cotton weft, plus a touch of linen for added strength and breathability, this wrap will soften very quickly and is suitable for all ages and wrapping abilities.